Carpet manufacture has undergone huge changes over the past few decades: a wider range of carpet fibres has become available and a wealth of new, advanced technologies has been adopted by this global industry. Carpet manufacture addresses the serious lack of information in this important area. After a review of the rich and colourful history of the industry from 400 BC to the start of the new millennium, the book concentrates on current carpet technology, from fibres to finishing. The author examines all aspects of manufacture, from selection of the raw materials to the principles of designing. The sophisticated techniques involved in weaving, needling, tufting and other manufacturing methods are also covered. The book also discusses handmade carpets and rugs. Carpet manufacture concludes with an extensive discussion of carpet performance assessment and testing, and the production of carpets for specialist locations such as sporting arenas and in transportation. 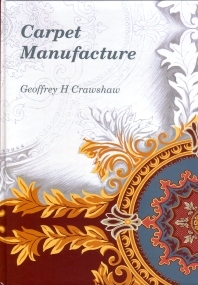 Historical background; Pile fibres; Pile yarns; Yarn processing; Backing materials; The principles of tufting; Patterning systems for tufted; Craft and related products; Axminster weaving; Wireloom weaving; Face-to-face weaving; Flat woven carpets; Production of needlefelts; Other methods of carpet manufacture; Coloration and chemical treatments; The principles of tufting; Designing; Patterning systems for tufted; Finishing of woven carpets carpets; Finishing of tufted carpets; Carpet tiles; Testing; Specialty carpets.